Platinum is one of the most popular metals for wedding rings because of its brilliance and durability, but bands made from this precious metal don't all look alike. There are a number distinct, uniquely beautiful rings available for brides and grooms. Some bands have only a single unique feature that can coordinate with an engagement ring, while others are more elaborate designs that can be worn independently. Regardless of your design preferences, if you are interested in platinum, a plain band is not your only choice. Click the "Buy Now" button on any ring photos after this slide for retail information. One beautiful and unique choice is to pick a wedding band that features gemstones. These his and hers bands have a graceful, natural shape. Alternating diamonds and sapphires accent the surface of the rings. The set retails for about $3,200. Celtic wedding rings come in platinum in a variety of knot designs. This handmade men's band features love knots framed in a channel of milgrain edging, which helps highlight and protect the pattern. It retails for about $8,500. Carved patterns can create unique platinum wedding bands without needing extra gemstones that may be outside a couple's budget. This exquisite ring, available for men and women, features vine and floral patterns. It retails for just under $2,000. Diamond pave-set wedding rings are the ultimate in glamour and sparkle with gems set along the entire surface of the ring. While small diamonds are the most common choice for pave settings, this ring uses larger stones in a symmetrical pattern to form the ring's band is a luxurious and stunning design. It retails for about $22,000. While a plain platinum ring can be beautiful, a multi-tone ring that surrounds colored gold with a platinum frame is more unique and equally stunning. This hammered 18k rose gold women's band offers a beautiful alternative to the plain wedding ring. It retails for about $2,800. 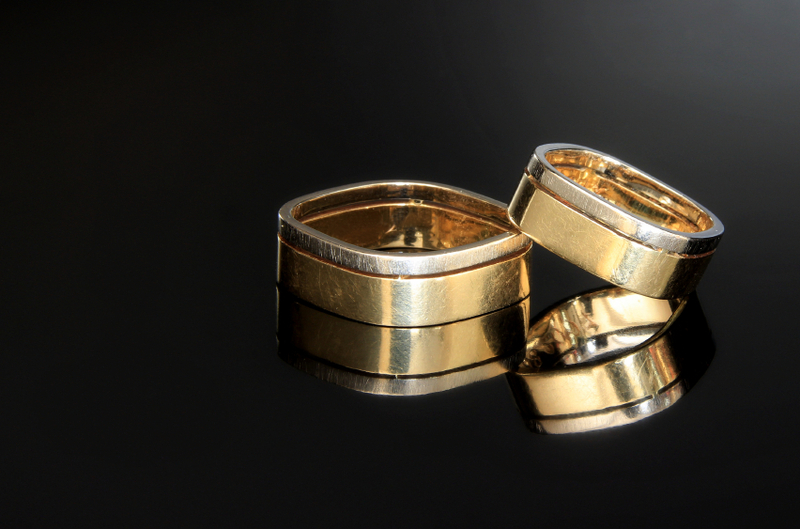 Many men's wedding rings incorporate strong, bold textures to give the ring a masculine appeal. This seven-millimeter ring features raised ridges or columns framed by ropes and ridges. It retails for about $2,800. A bezel set eternity ring is a delicate and unusual option for a wedding ring. 1.34 carats of colorless and fancy yellow diamonds make this beautiful ring even more eye-catching. It retails for about $2,300. Many unique platinum wedding bands incorporate metal braids, which provide a beautiful textured look. This six-millimeter men's band is accented by a center ridge and retails for about $2,800. For a unique wedding band that has vintage style, choose one inspired by designs of the past. This delicate platinum ring is full of Art Deco charm. The side of the shank is carved with a floral pattern, and one carat of round diamonds accents the band. This ring retails for about $6,200. Diamonds can be distinctive on a plain platinum band if they're set along the length of the ring instead of across it. This ring features a straight baguette diamond surrounded by tapered baguette diamonds in a simple platinum band. It retails for about $1,300. No matter which platinum design you choose, you'll love having a unique wedding ring that you aren't likely to see on anyone else's finger. These special rings are a great way to show off your one-of-a-kind personal style.